The shoulder joint is a ball and socket type of joint and is comprised of 3 bones, the shoulder blade, collarbone, and the humerus. These bones are connected by different ligaments, broad capsules, and the rotator cuff. The rotator cuff is made up of 4 muscles, the supraspinatus, infraspinatus, teres minor, and subscapularis. These work together to provide stability to the shoulder joint as well as rotate and raise the arm. Because the shoulder joint is built for so much motion, this leaves it vulnerable to injury. Impingement: Impingement occurs when a tendon of the rotator cuff, most commonly the supraspinatus, gets pinched between the humerus and top of the shoulder blade. This can occur if bone spurs form and narrow the space where the tendon glides through. Bad posture and weak muscles can also lead to impingement as these factors put the shoulder in a position in which the space for the tendon is narrowed. This can also occur due to natural anatomical variations that might predispose you to an impingement. A rotator cuff impingement may be the cause of both tendonitis and bursitis. Tendonitis: Repeated impingement and/or stress to the rotator cuff tendons can lead to increased friction and inflammation to the tendon. This can occur with repetitive overhead motions. Bursitis: Between the rotator cuff tendons and the top of the shoulder blade lies a fluid filled sac called a bursa. The bursa helps to absorb shock and cushion tendons to reduce friction. A shoulder bursitis is an inflammation of this bursa. This can occur when the space in which the bursa lies becomes narrowed (impingement). The repeated rubbing or friction on the bursa can cause inflammation and pain. Tear: A tear can occur with continuous impingement and/or tendonitis of the tendon, which over time can cause fraying and weakening of the tendon, and eventually a tear. It can also occur with acute trauma, such as a fall onto the arm. Tears can be partial or complete. Marked night pain that may awaken you and cause an inability to lie on the affected side. If you note that you have any of these symptoms, contact your doctor for an examination of the shoulder. He or she may request that you have an X-Ray or MRI or refer you to physical therapy to help with determining the problem. If you do have a rotator cuff injury, there are several treatment options. 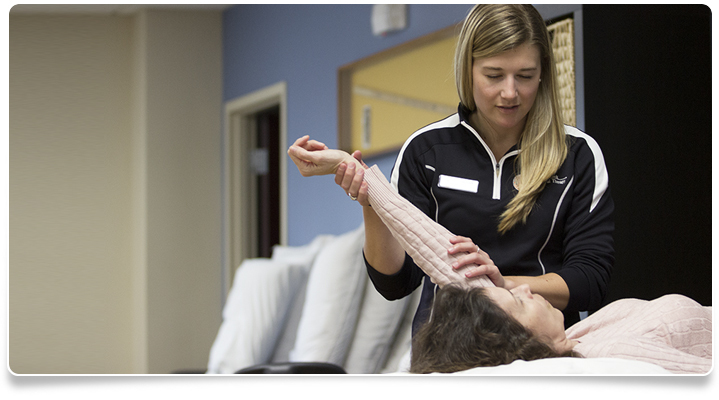 Physical therapy: A physical therapist will fully examine your shoulder and the surrounding areas to determine your impairments and what may be causing the problem. He or she will then develop a full and comprehensive plan to address what is causing the inflammation. This may include pain control procedures, postural education and muscle strengthening, range of motion exercises, and a full exercise program including the tools you will need to keep your shoulder healthy. Cortisone Injections: Your doctor may suggest a cortisone injection. He or she will inject a dose of cortisone, which is an anti-inflammatory medication injected directly into the joint space to decrease the inflammation and pain. Anti-inflammatories: Your doctor may also prescribe an oral anti-inflammatory medication to help control the inflammation and pain. Surgery: If you have a rotator cuff tear and have exhausted your conservative treatment options, your doctor may suggest having surgery to repair the torn tendon. After having a rotator cuff repair, your doctor may recommend physical therapy. Physical therapy can help to restore shoulder motion and strength so that you can return to your every day life with ease.